Partnering for Sustainable Development: Guidelines for Multi-stakeholder Partnerships to Implement the 2030 Agenda in Asia and the Pacific was prepared jointly by the United Nations University Institute for the Advanced Study of Sustainability (UNU-IAS), Tokyo, and the United Nations Economic and Social Commission for Asia and the Pacific (ESCAP), Bangkok. 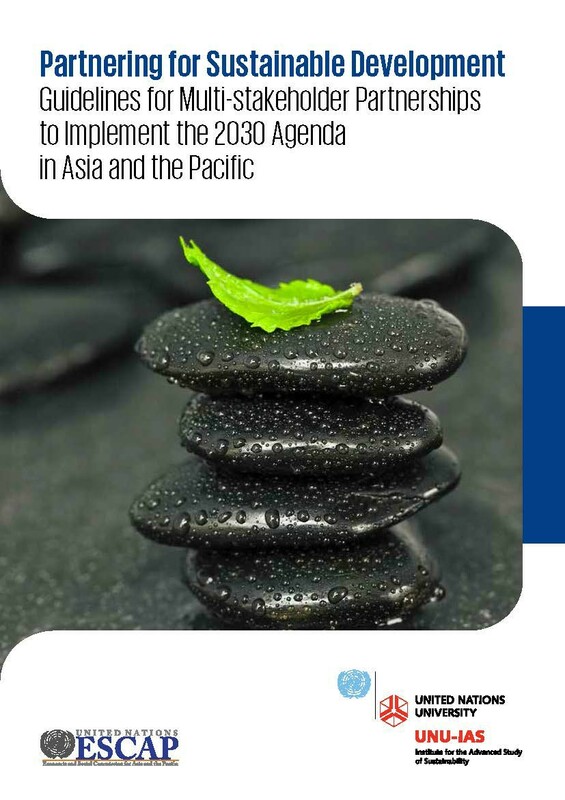 The guidelines contained in this publication provide practical guidance for United Nations member States, policymakers, practitioners and other stakeholders to build, strengthen and implement effective multi-stakeholder partnerships aimed at accelerating implementation of the 2030 Agenda for Sustainable Development in the Asian and Pacific region. The guidelines also highlight some of the key challenges in, as well as main success factors for, building successful multi-stakeholder partnerships towards achieving the Sustainable Development Goals. d. A brief section containing annexes provides relevant information on the multi-stakeholder partnership guidelines, including: (i) methodology for the preparation of the guidelines for the Asia-Pacific region; and (ii) resources for building and implementing partnerships and achieving the Sustainable Development Goals.